What do oriental carpets, craters and rilles, ancient mythology, rock art and plasma configurations have to do with each other? Along with others they are all pieces of evidence in a composite picture of catastrophe in ancient times. A Thunderbolts correspondent commented recently: "Most Every carpet from New Mexico has its version of these same designs." Another correspondent wrote: "I think your observations are spot-on. 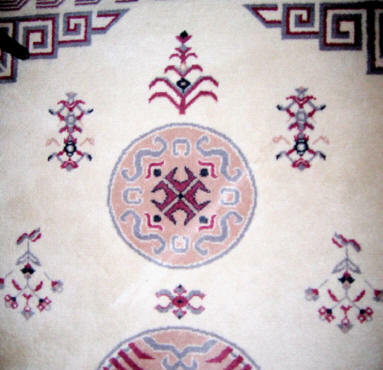 I was in Turkey some seven years ago and was flabbergasted to see many of these configurations appear on carpets. The designs are well-studied and have names in the literature. Most of these, especially the ‘tree of life’ with seven branches etc., are based on ancient traditions, according to the information I received. Intriguingly, a number of patterns match petroglyphs found in Turkey, dating from prehistoric times. I don’t know if the continuity of the tradition can be demonstrated all the way back to those petroglyphs, but it has to be there." 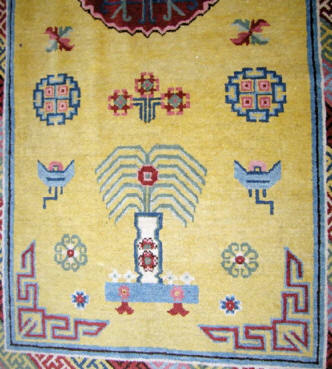 In the opinion of many investigators who are well-versed in both the science of plasma dynamics and the record of ancient myth from around the world, it is implausible that the traditional patterns that rug weavers have used for more than a thousand years are not representations of plasma discharge phenomena. Such representations have been passed down for generation after generation and rather faithfully represent the forms that emerge, especially those that are called "plasma instabilities". The circle with a square pattern in the center of one carpet at the top of the page is a quincunx, for example, and is widely distributed. 1. There must be a source for the powerful discharges beyond ordinary lightning. 2. The source must be external to the scarred body, i.e., another planet or moon. 3. The planets and moons must be charged to different levels. 4. The sources must have come close enough for their double layer sheaths to make contact. 5. These interactions require changes in planetary orbits from what we see now. 6. There are huge energy relocations necessary for orbital changes. 7. The energy relocations could only have caused havoc and catastrophe for an involved Earth. 8. These catastrophes should have left significant and unmistakable evidence. 9. These phenomena would have been witnessed and experienced by ancient people. 10. These catastrophes might have left significant and unmistakable "soft" evidence such as myths and mythological archetypes, symbols, artwork and graphical material. 11. Some of these phenomena may have taken place in the last few thousand years. If these speculations/conclusions are true, there must be some race-wide psychological condition that produces all the disparate mythologies, religions, fragmented time periods assigned for actual developments. These are only the most basic requirements; each one has other significant ramifications. Why even consider the coherence, or even any individual item, requiring such different conditions from those existing now? Because the evidence is actually there in all aspects and all cases. The group of scientists, scholars and researchers behind www.thunderbolts.info has been laying the groundwork primarily in the physical sciences for just such consideration for the last dozen plus years. While the group is not ignorant of the enormous challenge to established modern mythology, and the science edifices in cosmology, geology, paleontology, anthropology, chronology, archaeology, biology, etc., we know there is a vast reservoir of collected information concerning every one of the above requirements and these sundry academic disciplines.